Group-based support of families is an important aspect of service delivery for children who are Deaf/Hard-of-Hearing. The Joint Commission of Infant Hearing (2013) notes that parent-to-parent support is an essential aspect of effective Early Hearing Detection and Intervention (EHDI) systems. However, practically providing support to families can be challenging to implement. Barriers can include time from work schedules and childcare for siblings. Use of telehealth for family support can extend family support offerings beyond the local area, eliminate the need for childcare, and can be scheduled at times that are conducive to a work day (for example, a lunch group session). Family-to-family support meetings can be offered providing families an opportunity to connect socially and to share their personal stories, successes and challenges with other families. Such meetings can vary in size, leadership, and duration based on the unique needs of the families. Family education opportunities can also be held to increase knowledge and leadership skills. Telehealth can be an excellent way to provide families with opportunities to get information on the technology, intervention techniques, and/or access related professionals (counselors, occupational therapist, neurologists) even when those providers are not local. Group TI also can support training in new skills, fostering coaching and hands-on experiences to promote child language and learning. In contrast to traditional didactic training opportunities whereby the parent listens passively during the receipt of new information, training via telehealth focuses on engaging parents, providing them with an opportunity to observe others, try new strategies themselves and obtain feedback. Families also can apply the lessons while in their own home, supporting the use of the natural environment. 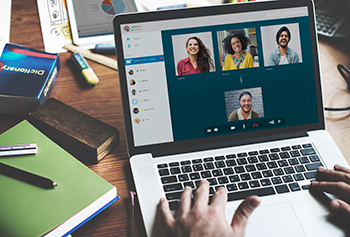 In a hybrid model, educators can provide in-person delivery with some of the group members present and include a link for families who are not able to attend in person. This helps to support the family with a sick child, childcare need, or an inflexible work schedule while also providing the in-person support to the families who prefer in-person communication. In an online session, all of the families connect online. This online support would provide a synchronous connection and the opportunity for families to connect. In a web-based communication, parents can log-on asynchronously and view material at a time that is convenient. While families may miss some of the interaction that a synchronous session may provide, a web-based model is flexible and convenient for families with young children. Content can also be captioned to provide greater accessibility for families. Forum/chats do not typically offer a great amount of formal education but can be incorporated as a way to support discussion and connection between families. Forums can be open-ended, allowing families to start spontaneous conversations, or can be facilitated by a provider. As shown in the table below, there are advantages and disadvantages of using telehealth for group-based programs. While telehealth may provide increased flexibility and opportunities for parents to log-in from a variety of environments, these environments may add to distractions and less focused engagement. Setting clear parameters and expectations with families helps to ensure that both the providers and the families can get the most from the experience. It should also be noted that some families appreciate the opportunity to participate even when they are multitasking during the session. A clinic-based program wants to offer families educational opportunities about cochlear implants and aural rehabilitation. Families have asked for these opportunities but every time they have been offered there is scant attendance. Provider gets a list of families who are interested in attending and topics that are of interest. A doodle poll is sent to all of the families and the programs are scheduled at the time/dates that work for the majority of the families. The courses are run in a hybrid model, where some families are present but families can also attend via Zoom. The presentation (powerpoint and recording) are shared on padlet following the presentation. There are a variety of internet-based tools to support group TI. These tools vary by cost and ease of use, so it is important to investigate options. Keep in mind that the more tools that you use with families the more they have to learn – remember to keep this user-friendly for families. Collaboration software such as Samepage has multiple applications, which means you only have to learn one platform. Again this would come down to preference. The initial investment of finding such a program will take time and comparing. The site capterra.com allows you to search and compare different programs for the tools that you would need. G2 Crowd is another software tool and services website that allows users to search any type of tool they're researching to learn more about that tool, compare it to similar tools and read over 400,000 user reviews. G2 Crowd is completely free to use for those researching software tools and services. 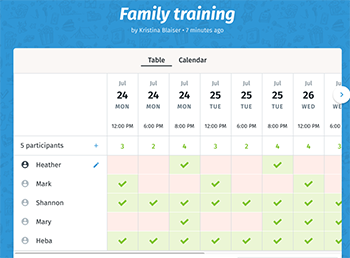 Use of scheduling technology, such as Doodle (doodle.com), can assist in the complicated task of finding a time that works for everyone. Families often vary in their comfort with the technology. Offering families access to an online tutorial prior the first session can make the session go more smoothly. This process can also ensure that technical difficulties or questions do not interfere with the content or the engagement of the session. Providing families with tips for turning their camera off and on and muting/un-muting audio is particularly helpful for times when families have young children that might come in and out of the room. Providing participants with an opportunity to give feedback on the pace, content, and technology is important for making ongoing iterative program changes. 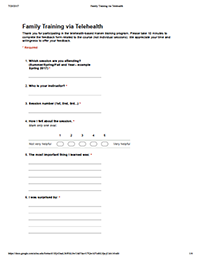 Use of an online survey/form is convenient for families and can be shared via email/course management system. Sessions can be recorded and reviewed at the families’ convenience. Recordings can be referred to later in intervention or shared with other family members and/or care providers. Some platforms offer “breakout sessions” where the participants can connect in smaller groups. These breakout sessions are helpful for ensuring all of the participants are engaged in the discussion and similar to a “think-pair-share” format used in live classes. These tools enable the presenter to engage participants and document brainstorming ideas and future opportunities. It is also possible for the presenter to save the screens and send them to participants for future reflection. Polls can be used to gain perspective on the participants thoughts and to focus conversation during the session. Many platforms offer “check-ins” that allow the participants to provide the presenter with feedback (such as speed, agree/not agree). Online course management systems or tools such as Padlet (padlet.com) can be used to exchange information with parents. If you would like to keep names confidential, parents can use “code words” as names – something like the name of their child’s favorite toy or character. Videos can be a useful tool for sharing information, reflecting on skills learned, and providing families with an opportunity to learn from each other. Some platforms offer better video sharing than others (i.e., come across clear without audio/video delays). If possible, fillable pdfs offer families an easier way to return documents to the provider. If fillable pdfs are not possible, offer suggestions for scanning apps (such as DocScan or Genius Scan). As with all telehealth efforts, it’s important to demonstrate the effectiveness of this delivery mode, often a requirement for reimbursement. Depending on the purpose of group TI, the measures Each of these different models have potentially different outcome measures of success as shown below. Measuring such outcomes can be achieved via tools such as online “polls” often built into online platforms such as Adobe Connect or by sending surveys to families prior to and after the group event. Thank you to Nanette Thompson, Listen Foundation; Kim Hamren & Suzanne Quigley, Listen and Talk; and Cheryl Broekelmann, St. Joseph’s for sharing their thoughts and experiences.